Here are a few live websites powered by iScripts EasyCreate. This information is submitted by our clients. 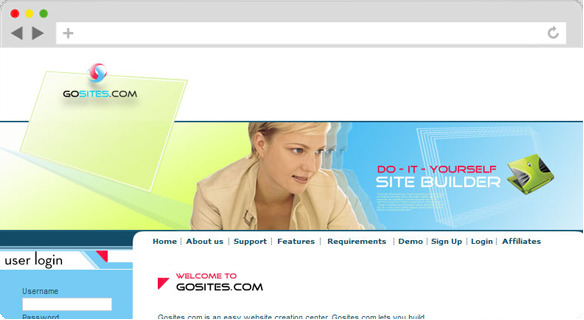 GoSites.com is a customized version of EasyCreate. An online site builder that helps you create your required websites in different designs and templates available throughout EasyCreate. They offer instant site-building facilities to newbies as well as professional users. Also helps to build professional and a complete web site in less than 5 minutes. Webbiz has developed a state of the art turn key business. Working with a network of companies you are able to utilize our easy to use website design software to build beautiful websites. We also provide the potential clients that need and want your service of building beautiful websites for their businesses.